My life as a music person is punctuated by periodic grand epiphanies (grand on a personal level that is), where seemingly out of nowhere a set of connections are suddenly made that bring into focus a particular artist or musical project in a way previously unseen. While I have smaller such epiphanies nearly on a daily basis, these larger episodes develop in the background, over many months or years before suddenly clicking together in an audio-chemical flash. 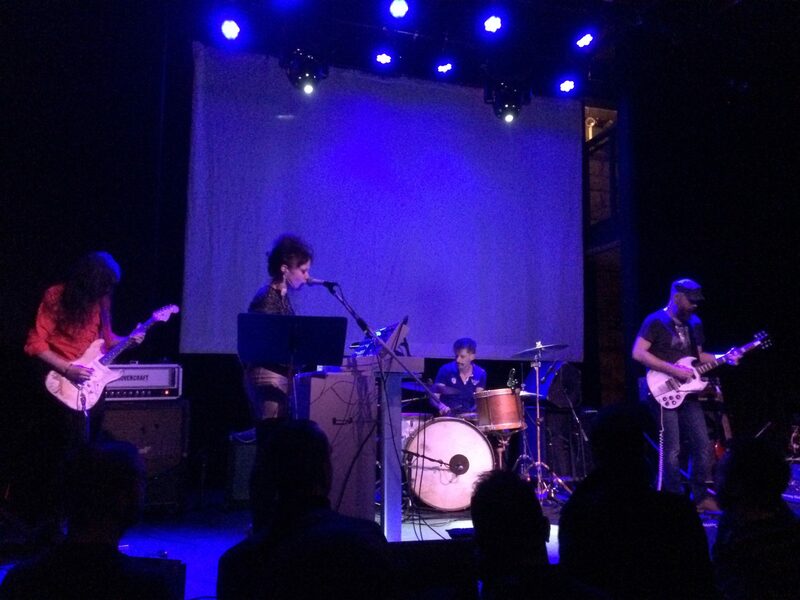 The Detroit-based band His Name is Alive is the most recent artist to capture my attention in this way, culminating in my checking out a live set last Tuesday at Rough Trade NYC in Brooklyn [February 10, 2015]. I'm not sure I ever heard anything by His Name is Alive before some time last year when, at a local branch of the Housing Works thrift store chain, I found a copy of their 2nd CD Home is in Your Head for $1 (the things I find at that thrift store is perhaps a topic for another post). I had become curious about the band after reading Facing the Other Way: The Story of 4AD a recently published book by Martin Aston that recounts the entire history of that famed record label. Throughout the early to mid-eighties I was somewhat of a 4AD fanatic, devouring pretty much everything I could find on the label. To this day I still own a significant portion of the catalog up until about 1987, including many rare 7" singles, most of the essential LPs and EPs and a few special edition rarities. But my fascination with the label began to wane as my general musical interests went in new directions, coincidentally right around the time that 4AD signed its first American bands. I pretty much lost track of the label and a good deal of other alternative music throughout the 90s as I focussed on my studies and eventual career in new music only occasionally becoming interested in something that connected with my teenage years, most of which I spent as a musician in the DC punk scene of the 80s. Things began to change however, sometime after moving to New York (May 2001). With my student days long behind me I gradually began to re-connect with my rock and alternative roots, rekindling old friendships, checking out the occasional show, and buying a CD here and there – basically reclaiming that part of my self. At some point in the mid aughts 4AD started to find its way back on my radar. By the middle of the decade it became apparent that a number of bands I had recently become interested in were now on the label's roster – Deerhunter, Stereolab, Gang Gang Dance, Blonde Redhead and the then Brooklyn it band TV on the Radio among them. While I was vaguely aware of 4AD's trials and tribulations over the years and the fact that original mastermind Ivo had long ago sold it, it seemed then that the label had somehow succeded in reinventing itself in its own original image. I've been following again ever since (though I can't say I'm very excited about many of the recent signings). When I discovered a slightly damaged copy of the aforementioned book [Facing the Other Way: The Story of 4AD] on the shelves at The Strand bookstore for $6 I snapped it up and promptly devoured all 650 pages within the week. Which brings us back to His Name is Alive. The band's name as well as that of it's creator Warren Defever comes up again and again in Facing the Other Way, and as I learned what an important part it played for the label throughout the 90s as well as the outsized significance it apparently held for Ivo, it piqued my interest more than any other band I was not yet familiar with that the book discussed . (A few other interesting bands I also learned about for the first time reading this book, some of whom were never on 4AD but might have been, Low for example). Over the last year I found their first two CDs Livonia, and Home is in Your Head and their fourth, Stars on E.S.P. each for $1 also at the Housing Works thrift store. From the start I could hear the kinship with old-school (or maybe "late early") 4AD, at least with the first two records. Had I heard them in 1985 I would have been instantly hooked, and even now I found them beautifully bewitching. The enigmatic forms, textures and moods set amid unpredictably fluid tempos, and the predominance of haunting and beautiful female voices put them very much in line with earlier 4AD staples Cocteau Twins, Dead Can Dance and the This Mortal Coil franchise….but with a few interesting twists. Importantly, I was surprised that this music came from the USA. Yes, 4AD began working with American bands in the late 80s, but those, and many to follow were more conventional, albeit great, rock bands, without much of the ethereal, existential, gothic-esque signature of the core European artists of the label. And then, as I began getting to know the later Stars on E.S.P. album (this happened only a few months ago) I discovered that there is so much more to His Name is Alive than 4AD could ever hope to contain. His Name is Alive is not a band per se, though it seems to periodically become one, and very convincingly so. It's really a studio project (of Warren Defever’s). The records are all very sophisticated studio efforts that endlessly explore unique sounds, forms and juxtapositions, often exploring a musical idea in multiple versions, and as with much of today's bedroom pop, it has to be reverse-engineered for the live setting. The recording is the original, and live is the copy. With the recent concert I attended, as well as time spent exploring the extensive history to be found on YouTube as a reference, when His Name is Alive goes live, it works, both as a convincing evocation of the original recorded work, but also as an autonomous interpretation. In any case, this is increasingly how things work in today's musical ecosystem. In this way, it seems His Name is Alive was somewhat ahead of the curve, by a decade at least. But the things that really stand out for me, what makes His Name is Alive unique and compelling, are really three qualities. The first is the ever-present sense of restless experimentation. No two songs or vignettes are alike, each one a unique proposal of what a piece of music can or might be, both in the instrumentation (which is almost always interesting and unconventional) and in the actual sounds. Each track is a soundworld unto itself. The second is a rich underlying musicality that grounds even the most abstract and minimal pieces, a musicality rooted it seems, in acoustic folk and roots music. There are even some tunes worthy of being considered part of the “Great American Songbook,” namely the wonderful This World is Not My Home triptych that frames the entire Stars on E.S.P. album. And lastly, there is a magical sensibility that pervades His Name is Alive, a mix of childlike wonder, nature spirits and folk mysticism, and maybe a little LSD! It’s similar to the kind of magic that characterized some of the classic 4AD artists, but that was arguably a much darker magic. His Name is Alive has its darkness, but there’s a greater joy and wonder here, and lot of good tunes. I'm looking forward to getting to know the rest of the catalog. Last Tuesday at Rough Trade the band played through the majority of its newest album Tecuciztecatl, a self-described “rock opera depicting an epic struggle between identical twins, reflective in nature, and mirrored in twin science, secret language, and mythology.” It would seem to be a radically new direction for the group, sounding more like some kind of classic 70s Rust Belt psych-rock. About a similar live set a few days later one DC-area tweeter quipped “@hisnameisalive was kinda in medieval heavy-psych mode tonight @blackcatdc, damn.” I think that nails it, damn. But is it really that new a direction? As with many of the great rock visionaries – think Bowie, Eno, Reed, Zappa (and maybe Ariel Pink?) – whatever the setting or concept or sound world they happen to be inhabiting at any given time, their underlying vision and personality always comes through. Suffice it to say, Tecuciztecatl is an excellent record! P.S. Oh, and who's ever heard of the Detroit band Viv Akauldren? Defever mentions them in YouTube interview…I saw them at DC Space in the 80s, maybe twice – what a cool band, I had totally forgotten! Comments closed — Trackbacks closed RSS 2.0 feed for these comments This entry (permalink) was posted on Friday, February 13, 2015, at 1:59 pm by danjoseph. Filed in Appreciation, Essay, Review and tagged 4AD, Detroit, HNIA, Rough Trade.